Nature brushes in DP Animation Maker are designed to imitate various effects found in nature including still water (ponds, shores etc. ), running water (streams, creeks, waterfalls etc. ), light, fire, day-night transition and clouds. Some of these effects require a specific background to function properly. For example, Water and Stream brushes will require a background with water image. But others, like Fire or Cloud brush, do not have this requirement and can even be used in scenes with a transparent background. To apply the effect of a nature brush to the scene, you need to paint the effect mask over the area where you want the effect to be. The opacity of the mask allows you to control the intensity of the effect: The intensity of the effect in opaque areas will be 100% while the transparent areas will not have the effect at all. 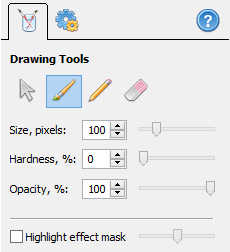 You can select one of three drawing tools here or you can switch to the pointer. The pointer doesn’t do any drawing, but instead allows you to select objects or to modify them. The other three tools are pencil, brush and eraser. The pencil allows you to paint the effect mask using a sharp-edged mask. The brush, on the other hand, has soft edges. For most nature effects, it is preferable to use the soft-edge brush as it allows the creation of a soft transition between the effect and the rest of the scene. The eraser is for removing the effect of a Nature brush or for correcting the area of the effect. You can adjust the Size of the tool, as well as its Hardness and Opacity. Small values of hardness lead to softer edges of the brush and the eraser tools (the pen has 100% hardness). Reduce the value of opacity to achieve better transparency of the brush and softer blending of the applied brush effect with the background. The “Highlight effect mask” option allows you to visualize the brush mask in the process of drawing to make it simpler and more precise.